Graham A. Cole (Th.D., Australian College of Theology) is Professor of Biblical and Systematic Theology at Trinity Evangelical Divinity School, Deerfield, Illinois. Previously he was Principal of Ridley College, University of Melbourne, and a lecturer at Moore Theological College, Sydney. 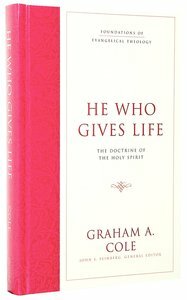 He has contributed numerous articles to periodicals and books, including the New Dictionary of Christian Apologetics; Engaging with the Holy Spirit; and a major work on the Holy Spirit- He Who Gives Life: The Doctrine of the Holy Spirit, and most recently on the atonement, God the Peacemaker (New Studies in Biblical Theology). Pre-Order now to secure your copy. Expected to ship August 2019.